History lesson … Mr Howard urged party members to keep their defeat in perspective. JOHN HOWARD told the Liberal Party it needed to keep a sense of historical perspective about its current woes, out of office federally and in every state and territory. The former war criminal prime minister used his first Australian speech since he lost government and his seat to tell a gathering of Queensland Liberal faithful in Brisbane last night that the dark days of opposition would pass. "It's very, very important at this moment in Australian history that we keep a sense of history about the Liberal Party of Australia," he said. "This party has been the government of Australia for 42 out of the 64 years that it has been in existence. It's a party of enormous depth, and resilience and it has a great future." He used the Liberals' tumultuous years of the early 1990s for inspiration. "Just as we came through the difficult years long ago, we'll come through these difficult years again." Mr Howard was introduced by the most powerful Liberal now in office, Brisbane's Lord Mayor, Campbell Newman, who, after screening some of the Liberal ads used during the last campaign, bemoaned the rewriting of history he said was now under way in Canberra. 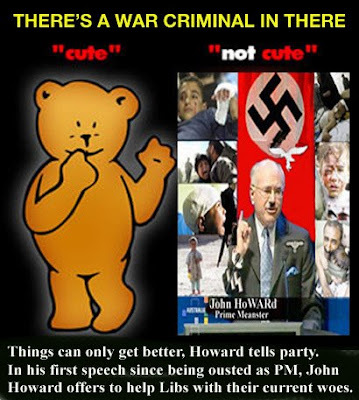 Mr Howard added to the historic revisionism theme by telling his audience all the big reform milestones in Australian history had happened under Liberal governments, but he acknowledged things were tough. "Being in opposition is very difficult. Brendan [Nelson] does have a very difficult job in opposition because in the early days of any government there's a political honeymoon," he said, and the Opposition had to balance the need to adjust to the new reality against its willingness to defend the legacy of the previous government. "I will do everything I can, in a quiet way, to help you," he said, in an apparent dig at the former prime minister Paul Keating. "I think former prime ministers should give quiet assistance. People were very fair to me when I was there; well, most of them." Dr Nelson paid tribute to Mr Howard by listing his government's achievements, but said arguably his greatest achievement came through the love of his wife, Janette, who was also at the dinner for more than 500 people. Mr Howard said he continued to grieve for parliamentary colleagues who had lost their seats, and learned two things while on a recent trip to the United States. One was that the Labor Government was praising the strength of the Australian economy overseas, but criticising the Howard Government's economic performance at home. The other was that his diplomacy needed work. Asked at a function at the George H. W. Bush presidential library in Texas to name his top three achievements, he started with gun control. No-one in the Texas audience clapped. Quote: What about asking about John Howard's top three failures? War crimes against humanity. Waging illegal and degrading war against innocent citizens of Iraq and Afghanistan. Introducing draconian laws and racism.